1 of 4 Place quinoa and pepper blend in a saucepan and cook following package directions. Once cooked, stir in beans and 1 cup of the salsa. 2 of 4 While quinoa is cooking, heat oven to 350 degrees . Coat large baking sheet with nonstick cooking spray. 3 of 4 Heat tortillas in microwave for 45 seconds to soften. Place 1/2 cup of the quinoa mixture in center of each tortilla and fold like a package. Place seam-side down on baking sheet. 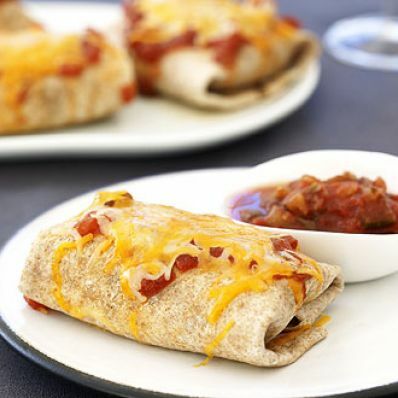 4 of 4 Lightly coat burritos with nonstick cooking spray and top with remaining salsa and cheese, dividing equally. Bake burritos at 350 degrees for 12 minutes until heated through, with cheese melted. Serve with additional salsa.